Red Green is an Odyssey2 homebrew tech demo. 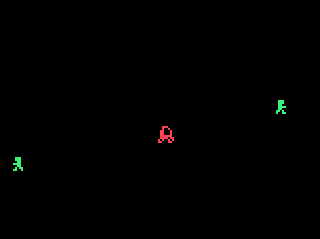 It is a simple program which lets the player move an animated red car, while green people are flying by, giving the impression of movement. Red Green is written in the assembly language of the Intel 8048 CPU at the heart of the Magnavox Odyssey2. I found it cumbersome to write for. The SDK package available for download also contains Soeren Gust's HTML tutorial. I've included it because it is a good reference and because Soeren's website is now defunct. I've extracted it from the Wayback Machine. Odyssey2 SDK - use this to develop your own Odyssey2 homebrew. It contains the source code for Raining Squares. It also contains a tutorial and additional examples. Tested in Windows XP.